The 6th Cinemalaya Film Festival 2010 was held at the Cultural Center of the Philippines (CCP) in Manila from July 9-18, 2010. 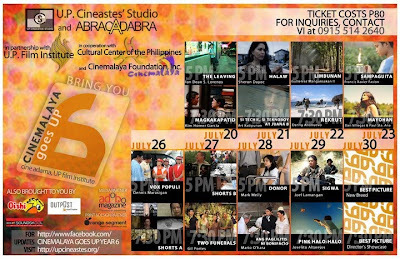 For those who have missed the 9 films of the New Breed Full-length category, 5 films of the Directors Showcase category and 2 sets from the Short Features category (with 5 short films each), this is your chance to see them at Cine Adarna, UP Film Institute, University of the Philippines-Diliman, Quezon City from July 20 to 30, 2010. If you want to see a glimpse of some of the movie trailers, you can check it here. For more information, contact Vi at +63 915 514 2640 or check U.P. 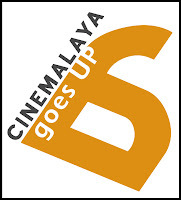 Cineastes' Studio website.